This installment of my “Retro T.O.” online column for The Grid was originally published on May 22, 2012. Toronto Star, December 18, 1971. To some, it provided a welcome respite from braving the elements on their lunch break. For others, especially those working in its retail outlets, it made them feel like a mole. The three kilometres of underground shopping malls and tunnels that 175,000 office workers passed through daily in May 1980 formed the spine from which today’s PATH system grew. It was hoped that a climate-controlled underground route would avert these problems and provide protection from Mother Nature—as Toronto development commissioner Graham Emslie told the Star in 1971, “let’s face it, there are a hell of a lot of days you’d just as soon not walk outside.” The first major connection in the primordial PATH, which linked Nathan Phillips Square to the Richmond-Adelaide Centre, opened in January 1973. 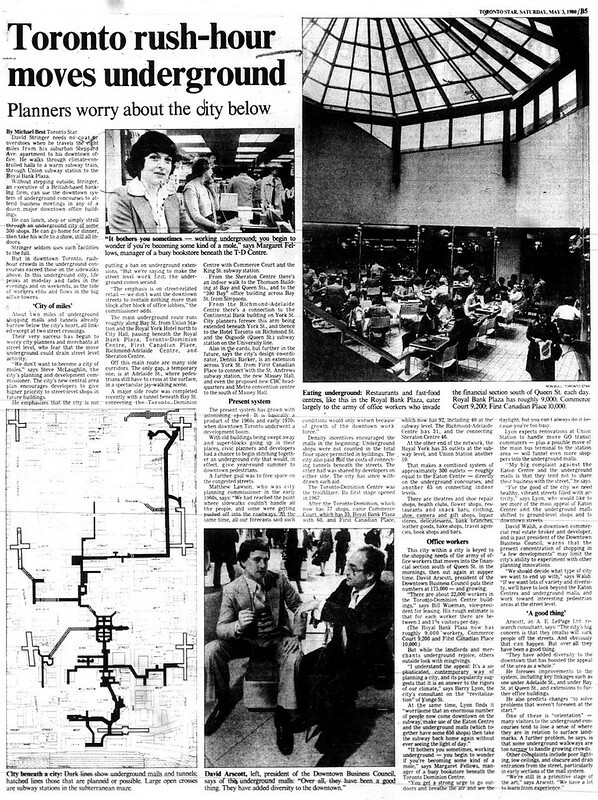 By May 1980, apart from a gap at Adelaide Street that became a haven for jaywalkers, one could wander underground from City Hall to Union Station. Toronto Star, November 17, 1973. Click on image for larger version. Toronto Star, May 3, 1980. Click on image for larger version. 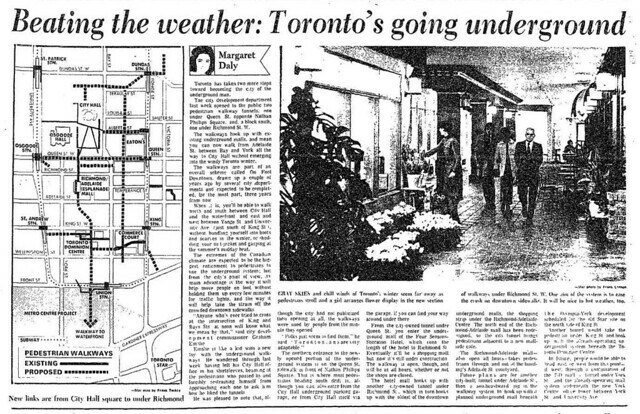 Downtown Toronto underground pedestrian mall system, 1981. City of Toronto Archives, Fonds 200, Series 1465, File 408, Item 5. Within the next decade, some of those issues were resolved. The Adelaide gap was fixed in 1984, while a tunnel opened under Bay Street in 1990 that properly connected the Eaton Centre and Simpsons (now The Bay) to the rest of the PATH. Signage would long remain a problem, one caught between city politicians who wanted clear wayfinding versus landlords who didn’t want to create the impression that the network was a truly public space. “People bound for jobs in the financial district pour out of Union station into the underground mall section of the Royal Bank Plaza. It’s been described as an ‘environmental vaccuum’ by some due to the poor artificial lighting and the mechanically recirculated stale air.” Photo by Erin Combs, 1985. Toronto Star Photo Archive, Toronto Public Library. While a few people may have mutated into moles over the years, the surface streets remain filled with those seeking a breath of unfiltered air during the workday. Additional material from the December 18, 1971, January 11, 1973, and May 3, 1980 editions of the Toronto Star. Originally published on Torontoist on January 28, 2015. Toronto Star, November 5, 1975. In terms of large-scale development, the neighbourhood was waking up. Headlines transitioned from the complaints about youth in Yorkville to announcements of new office towers and shopping complexes. By the end of 1970, over 200 storeys of new space were expected to be built within the next four years. While buildings like the Manulife Centre and 2 Bloor West materialized, other ideas, like a pedestrian walkway above Bloor Street into the Colonnade, remained on the drawing board. Among the first projects announced was a reshaping of the northeast corner of Bloor and Yonge. 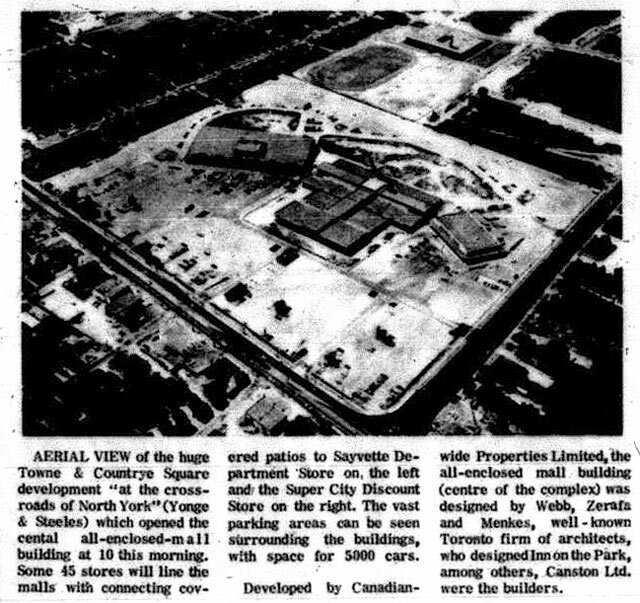 Backed by affiliates of Swiss-owned developer Fidinam, Toronto architectural firm Crang and Boake revealed plans for the as-yet unnamed complex in June 1969. They called for an office tower, an apartment/hotel tower, two levels of shopping, and an 800-vehicle garage, among other features. Sitting atop a major commuter hub, the complex linked into a series of underground shopping centres stretching westward, whose foot traffic would allow landlords to charge hefty rents. The project soon secured interest from Famous Players cinemas and, vacating its old building on the corner, Royal Bank. Toronto Sun, August 7, 1974. Two major tenants were announced in December 1971: the Workmen’s Compensation Board (WCB), which planned to rent up to 13 floors of office space, and Hudson’s Bay Company. The Bay was familiar with the neighbourhood, having operated a branch of its Morgan’s chain at the present site of Holt Renfrew. The new store would serve as the flagship for the Bay’s rapid expansion in Eastern Canada. It also lent its name to the project: the Hudson’s Bay Centre. Political controversy soon arose at Queen’s Park. It emerged that Fidinam, which received a $15-million loan from the WCB toward construction, donated $50,000 to the ruling provincial Progressive Conservatives following the decision to move the WCB into the building. A probe by attorney-general Dalton Bales found no wrongdoing under existing laws. When The Bay opened on August 7, 1974, district general manager Al Guglielmin promised it would give Eaton’s and Simpsons “a good run for their money.” The 260,000-square-foot store was touted as the first major department store to open in the core since Eaton’s College Street (now College Park) welcomed its first customers in 1931. A fifth-floor exhibition hall showcased displays from community groups. Of its three restaurants, the highlight may have been “The Edibles,” a buffet-style restaurant with English cuisine (roast beef with Yorkshire pudding, fish and chips) decorated with cartoons by Ronald Searle illustrating the company’s colorful history. Toronto Sun, January 12, 1977. A parade on the Bay’s opening morning ran from Varsity Stadium to the store. A year later, on November 6, 1975, the rest of the complex officially opened. To celebrate, high-wire performer Jay Cochrane walked the 287 feet between the two towers at a height of 439 feet above ground, sans safety devices. An object lesson in how to take one of the two most important intersections in Toronto—Bloor and Yonge—and wreck it. Without windows or doors to break up its solid concrete facade, this Crang & Boake monstrosity looks more like a bunker than a department store. The only way life has returned to the corner is through the itinerant vendors who set up their wares around the centre. Left: Globe and Mail, November 17, 1975. Right: Toronto Star, October 28, 1975. In recent years, the shopping complex underwent years of renovations. The Bay gradually lost its flagship status after Simpsons on Queen Street changed branding. It appeared the space would be transformed into the Canadian flagship for Saks Fifth Avenue, until Hudson’s Bay management decided to convert part of the Queen store. Height-wise, the complex looks tiny compared to new neighbours like One Bloor East. Amid the current developments in the neighbourhood, some might say the site feels like the Rip Van Winkles it displaced. Additional material from the June 18, 1969, December 7, 1971, March 17, 1972, October 1, 1973, and November 7, 1975 editions of the Globe and Mail; and the November 14,1970, November 2, 1972, January 5, 1973, July 17, 1974, August 1, 1974, May 9, 1987, and September 19, 1998 editions of the Toronto Star. Originally published on Torontoist on November 19, 2014. Globe and Mail, November 15, 1956. What Cloverdale lacks in flashiness it makes up for by serving its neighbourhood. Initiatives such as offering free temporary space for non-profit organizations and a “Heartwalkers” program for health-conscious shoppers demonstrate an awareness of the community’s needs. The mall’s efforts have been rewarded, too: in 2007, Cloverdale won the inaugural Social Responsibility Award from the Canadian branch of the International Council of Shopping Centres for its fundraising campaign to build the city’s first free-standing residential hospice, the Dorothy Lea Hospice Palliative Care Centre. There was a tinge of glitz to Cloverdale’s opening on November 15, 1956. The original 34-store section of the open-air plaza consisted of two rows of businesses separated by a 30-foot wide walkway. Tile mosaics designed by Joseph Iliu provided storefront decoration—the largest was a seven-by-19-foot panel on the west wall of the Dominion supermarket depicting fish, produce, and a cocktail glass. Globe and Mail, November 22, 1956. Businesses at Cloverdale quickly found ways to draw in customers. 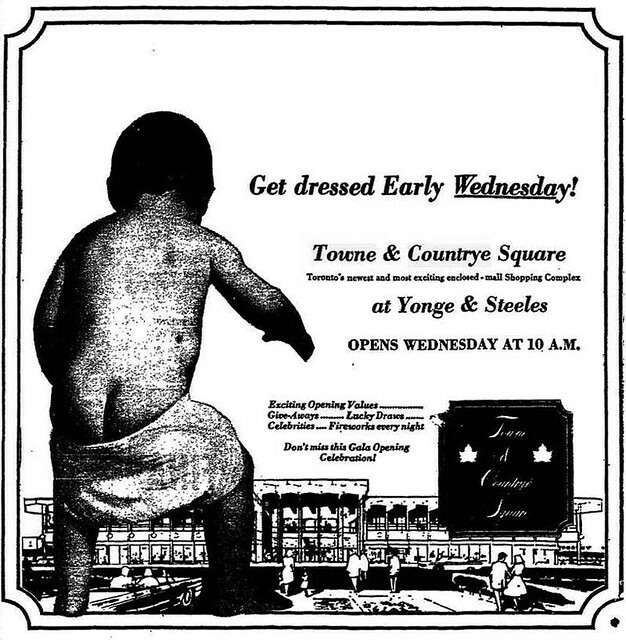 Major retailers such as Dominion benefitted from Etobicoke’s relaxed evening-shopping bylaws. Record store owner Wilf Sayer capitalized on the growing power of teen consumers. He began inviting them to his shop on Tuesday nights for listening sessions and dancing, offering pop on the house. As the events became more popular, Sayer stopped subsidizing the drinks and moved the dances into the plaza. After 600 people showed up for the July 2, 1957 starlight dance, he turned the event into a biweekly affair. In an interview with the Globe and Mail, Sayer encouraged parents to chaperone so they could “see for themselves that it is a wholesome evening of entertainment.” While the playlist included Elvis Presley and other early rockers, squares were pleased by the strains of Pat Boone and Andy Williams. Globe and Mail, July 17, 1960. The mall gained a major anchor when Montreal-based department store Morgan’s opened a branch in August 1960. Globe and Mail advertorial columnist Mary Walpole wrote that the store “has an air of big town sophistication and which we think is a compliment to the people who go a-shopping there … whether it is mother and the carriage crowd in sun dresses and slims or smart suburbanites who might have stepped off the cover of Harper’s [Bazaar].” The Morgan’s space would later house The Bay, Zellers (which relocated from elsewhere in the mall), and Target. Etobicoke Gazette, August 5, 1976. The mall, which was enclosed in 1976, has seen its ups and downs. But local retailers such as Hot Oven Bakery and Taylor Somers clothiers have stayed for decades, enhancing Cloverdale’s community-oriented feel and offering the mall some stability. Several other current tenants either have been around since the beginning (LCBO, Scotiabank) or are descended from early businesses (Coles, Metro). Major retail announcements in Toronto increasingly tend to focus on high-end “prestige” outlets or cheap chic, so it’s reassuring that a pretension-free mall such as Cloverdale manages to survive, and to continue serving its community. Additional material from the November 16, 1956, November 17, 1956, August 3, 1957 and August 19, 1960 editions of the Globe and Mail; the April 29, 2013 edition of The Grid; and the September 26, 2007 edition of the Toronto Star. Globe and Mail, November 16, 1956. Globe and Mail, November 17, 1956. Etobicoke Gazette, August 12, 1975. Etobicoke Gazette, August 19, 1975. Originally published on Torontoist on November 6, 2014. While most time capsules are buried in the foundations of buildings, their contents to be revealed at some future date, Cumberland Terrace is a living (if barely breathing) piece of Me Decade retail architecture frozen in time. Promoted as “the nicest way from Yonge to Bay” when it opened in October 1974, the mall’s resistance to modernization—orange and brown tiles, large banks of phones, signage for chains such as Teriyaki Experience unused elsewhere for decades—gives Cumberland Terrace the feel of a living museum, and makes it perfect venue to celebrate the history of Yorkville. According to Trifold’s website, it’s an attempt to “revitalize, direct traffic flow and brighten up Cumberland Terrace’s walkway by creating an engaging yet aesthetically pleasing atmosphere.” Given 9,000 square feet to cover, their designers combined sketches, historic photos, and watercolour splashes on white backgrounds, bringing some light to the dingier corners of the mall. From stories of Victorian businesses such as Frogley’s Bakery and the Severn Brewery, to tales from the neighbourhood’s hippie era (including a nod to Joni Mitchell), the project covers the breadth of Yorkville’s varied history. Most of the stories run the length of an average storefront, although some stretch out a bit farther—one series of panels offers visual representations of TIFF People’s Choice Award winners, while another salutes the local contemporary art scene with a tribute to the late Walter Moos that incorporates works he displayed at his gallery. The panels fill space while the future of Cumberland Terrace is determined. Since 2008, several developers have come forward with proposals to bring the site into the 21st century. Owner Oxford Properties submitted a development application to the City this summer based on designs by architectsAlliance. The plan calls for a 54-storey residential tower with a 50-foot lobby surrounded by a revamped mall that will be better integrated into the streetscape. But until a proposal is chosen and construction begins, visitors may continue to marvel at the time-warped Cumberland Terrace, and perhaps learn a bit about the history of Yorkville, too. As of June 2018, the history panels are still there, and Cumberland Terrace still awaits redevelopment. Vintage Toronto Ads: What Does He Want from Mr. Mort? Originally published on Torontoist on February 26, 2013. 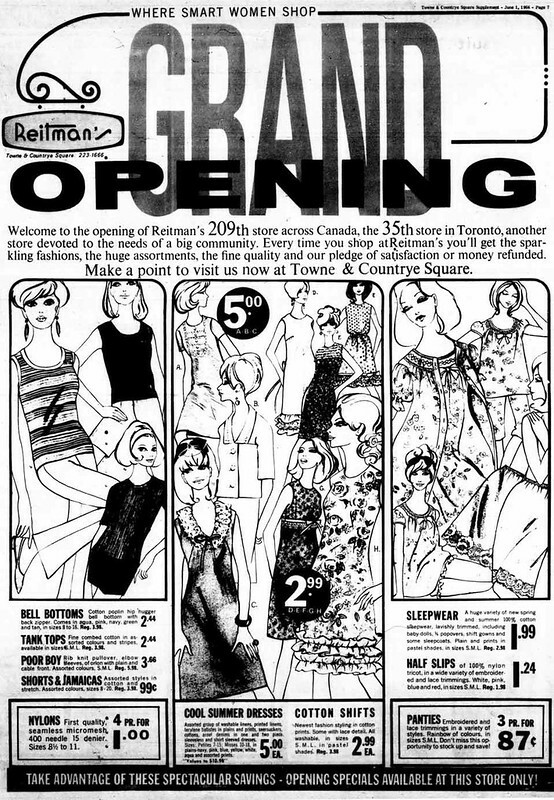 Don Mills Mirror, December 16, 1970. Did the boys at Mr. Mort’s succeed in their quest to make heroines out of girlfriends/partners/wives determined to give their man the most stylish winter threads 1970 had to offer? Or did those men stumble upon this ad and shake their heads in disbelief at what this groovy clothier had to offer? The main figure in the ad is decked out in a finely tailored suit, apparently named after a brand of house paint. The description doesn’t indicate if customers can use paint chips to select the perfect colour combinations to weave into the smart, checked pattern. Model B–C shows off Mr. Mort’s casual combination. This outfit is ideal for swinging get-togethers with other couples, hitting the party scene, or, with sunglasses on, driving down the highway with the radio at full blast. But be careful—the police might ticket you for driving under the influence of fine fashion! Model D—the “leathers are in” gent—is definitely a man on the move. His ensemble is ideal for a mod mob enforcer, a primped-up pimp, a sharp-dressed bank robber, or a small-time radical terrorist. It’s an outfit any man would wear with pride on the day they suddenly decide to hijack a plane to Cuba. Don’t forget the finishing touches! The vest scarf is a fantastic item for keeping any neck warm, but proper sizing is important. Mr. Mort does not take any responsibility for customers who accidentally choke themselves by buttoning up too tightly. Your heroine will thank you for continuing to breathe. The series wasn’t as popular as other material Torontoist published, thus not making it worth the premium rate (relatively speaking) I received as a staff writer. As for why there’s no indication that this was the end, there was talk of occasionally reviving it for gallery-style posts. A revival lasted from November 2014 to August 2015. Author Jamie BradburnPosted on May 1, 2018 Categories torontoist, vintage toronto adsTags 1970s, clothing, don mills centre, fairview mall, fashion, malls, menswear, mr. mort, retail, shopping centresLeave a comment on Vintage Toronto Ads: What Does He Want from Mr. Mort? Originally published as a “Historicist” column on Torontoist on January 19, 2013. 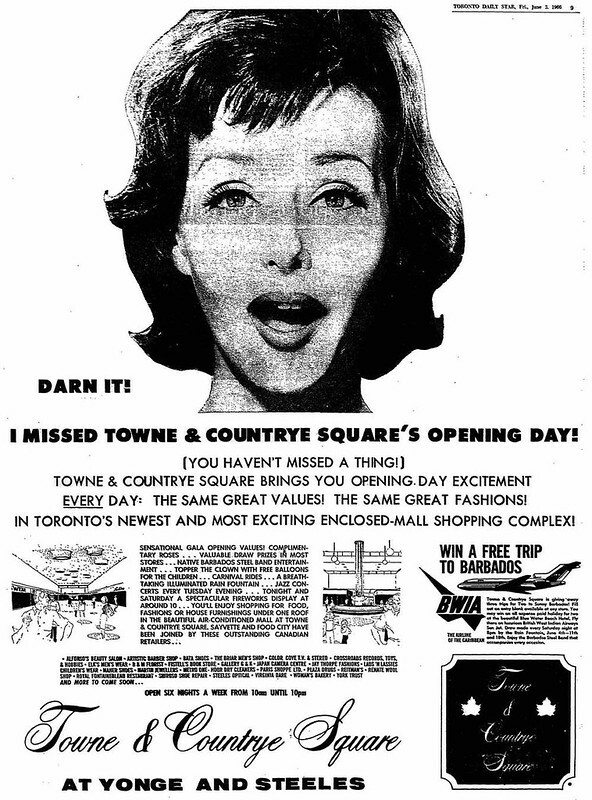 Following the opening of Lawrence Plaza in 1953, North York went shopping plaza mad. As the once-rural township transformed into postwar suburbia, farms gave way to large retail structures and their accompanying parking lots. From small neighbourhood strip malls to major shopping centres like Don Mills and Yorkdale, North York residents could do most of their shopping near home. Among the participants in this boom was the oddly spelled Towne & Countrye Square. 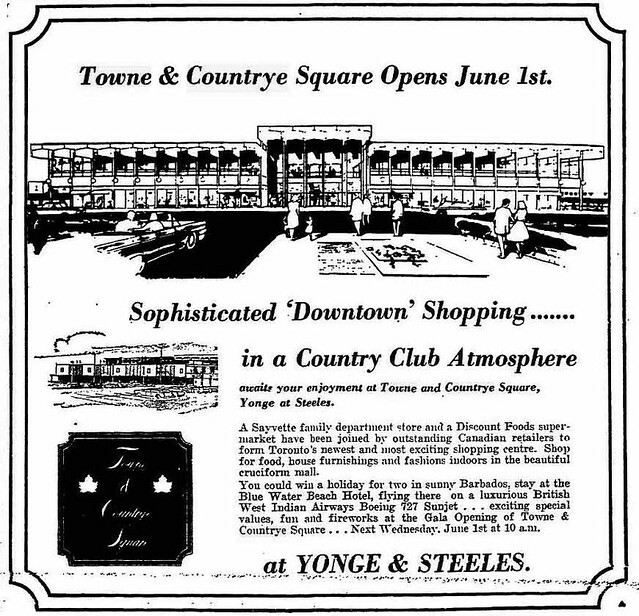 When it opened at the southwest corner of Yonge Street and Steeles Avenue in June 1966, it touted itself as “Sophisticated ‘Downtown’ Shopping in a Country Club Atmosphere.” Although one would be hard-pressed to find any resemblance between a genteel golf course and the shopping centre’s present-day incarnation as Centerpoint Mall, credit the opening day ad writers for their imagination. 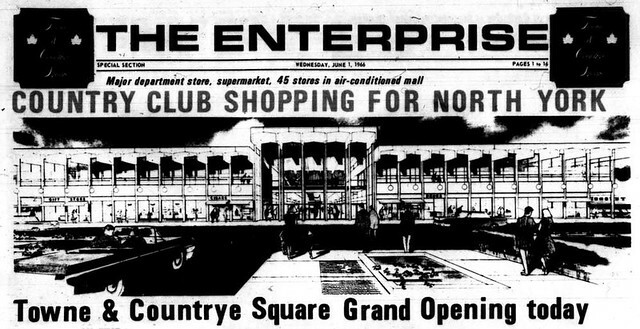 As was typical of the era, the mall was greeted with several advertorial pages in the community newspaper, the Enterprise. 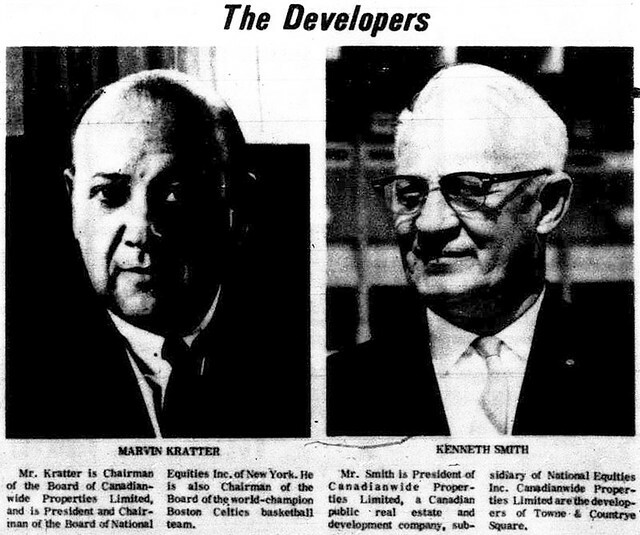 Globe and Mail, November 16, 1961. 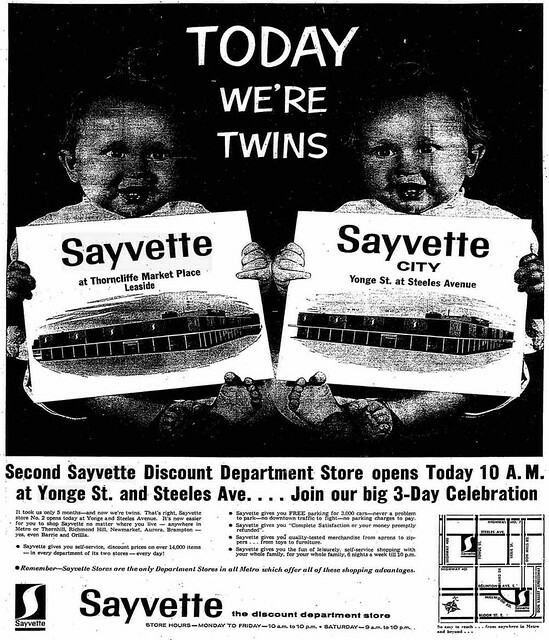 The oldest component of Towne & Countrye Square was Sayvette, which opened in November 1961. It was the second location for the discount department store chain, which had launched five months earlier in Thorncliffe Park. Management’s dreams of quickly building a Canada-wide chain crashed after the chain sustained a $1.5 million loss in 1962. By the time Towne & Countrye Square was built, Sayvette was supported by a mysterious saviour who eventually turned out to be Loblaws. The Enterprise, June 1, 1966. Mall developer Marvin Kratter was one of Sayvette’s initial investors before withdrawing his shares within a year of the chain’s launch. The New York City-based real estate investor briefly owned Ebbets Field in Brooklyn then built the apartment complex which replaced the legendary baseball stadium after the Dodgers moved to Los Angeles following the 1957 season. When Towne & Countrye opened, Kratter owned the Boston Celtics basketball team, who had just won their eighth consecutive NBA title. His New York Times obituary noted that Kratter viewed the team as a vehicle to promote one of his other investments: Knickerbocker Beer. Toronto Star, May 25, 1966. 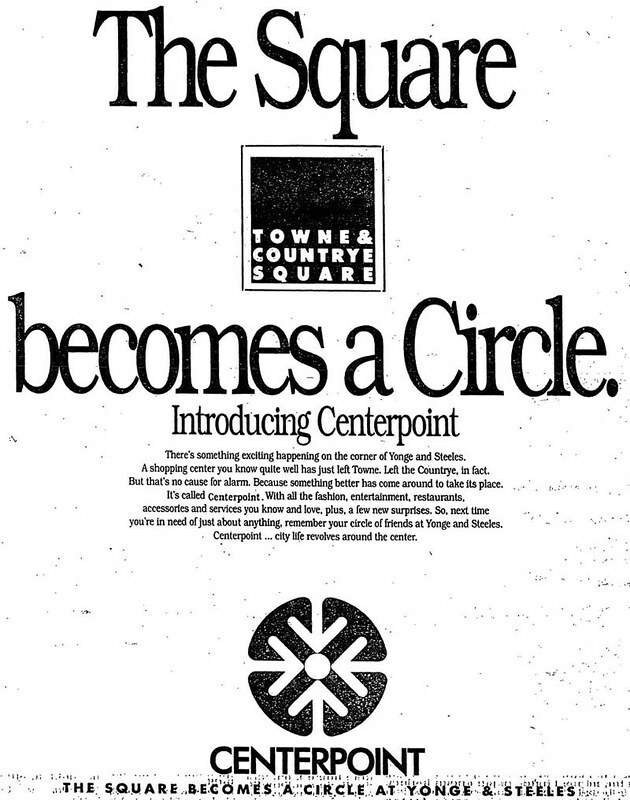 Ads for Towne & Countrye Square began appearing in local newspapers a week before the official opening on June 1, 1966. Toronto Star, May 30, 1966. Management tried to draw every demographic to the new shopping centre, including toddlers mutated into giants by atomic radiation. The Telegram, May 31, 1966. Among the amenities not mentioned in this ad: an auditorium, banquet space for up to 400, and a Tuesday night jazz concert series. Indoor suburban shopping centres were still a novelty in 1966. “A completely enclosed shopping mall,” the Enterprise advertorial noted, “is like a building turned inside out. The entrances are on the inside and the outside is actually the backs of stores.” Designers used touches like quarry tile flooring, light filtered through skylights, plants, park benches, and street lights to create an illusion of being outside. 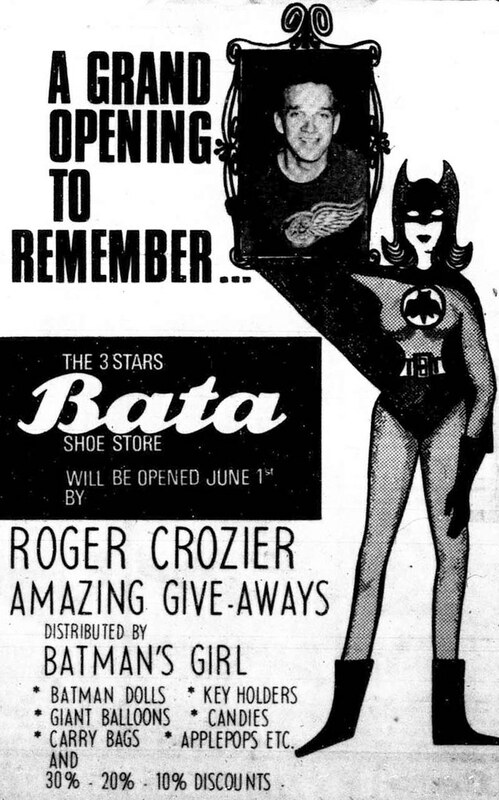 It may seem odd that Bata didn’t bring in a Maple Leaf to open their Towne & Countrye location, but Detroit Red Wings goalie Roger Crozier was a good choice to draw in hockey fans. Despite suffering a bout of pancreatitis at the start of the 1965-66 season, Crozier led the Red Wings to the Stanley Cup finals. Though the Montreal Canadiens hoisted the cup, Crozier was rewarded for his efforts with the Conn Smythe Trophy as the playoffs MVP. Bata also tried to exploit Batmania, though it was a year ahead of the Adam West TV series when the shoe store unveiled its version of “Batman’s Girl.” While a short-lived “Bat-Girl” served as a romantic interest for Robin in early 1960s comic books, this female caped crusader could almost be a prototype of the better-known Barbara Gordon incarnation of Batgirl. 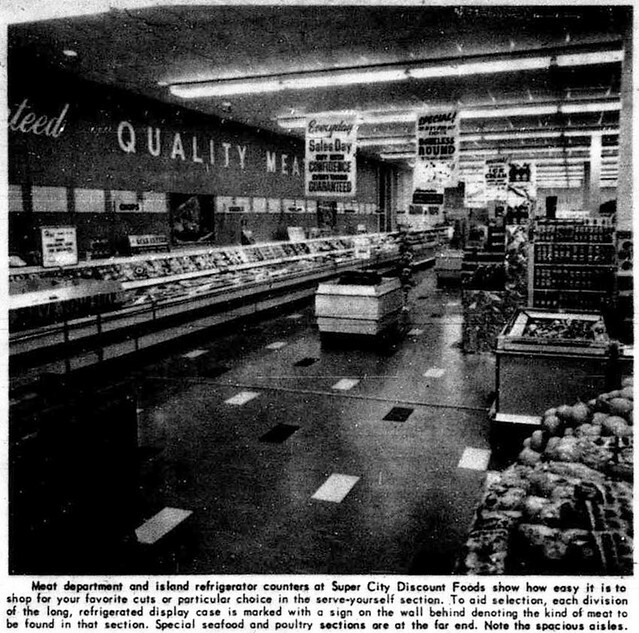 Super City Discount Foods was Loblaws’ lower-price banner during the 1960s, though management refused to publicly confirm or deny the grocery giant’s involvement. In the annual corporate report, Loblaws listed sales derived from Super City among other unidentified subsidiaries like National Grocers and Pickering Farms. 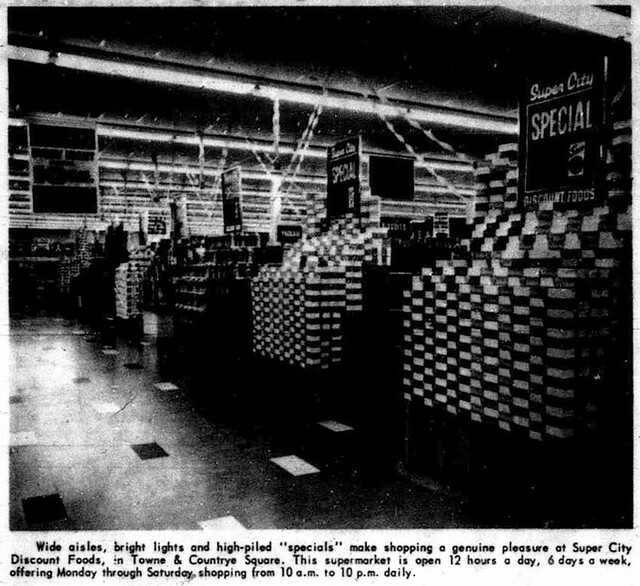 By the time the connection was acknowledged in the late 1960s, Super City was merged with another Loblaws-owned budget chain, Busy-B. Toronto Star, June 3, 1966. If this customer made up for missing opening day by becoming a regular patron of Towne & Countrye Square, she would have witnessed many changes in the years to come. 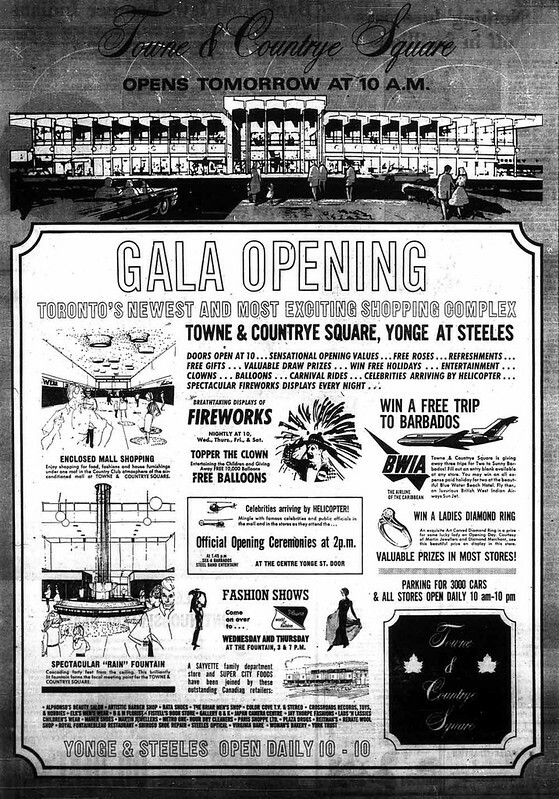 Later additions included a movie theatre and a Bay department store, while Sayvette was replaced first by Woolco, then a succession of Loblaws-owned banners. Toronto Star, November 29, 1990. Additional material from the June 1, 1966 edition of the Enterprise, the October 19, 1966 edition of the Globe and Mail, the December 9, 1999 edition of the New York Times, and the March 28, 1991 edition of the Toronto Star. Originally published on Torontoist on June 8, 2010. Financial Post 500, June 1982. The pitch Olympia & York used to entice businesses and residents into the still-under-construction Queen’s Quay Terminal seemed to work. As the spring of 1983 approached, nearly all of the retail space was leased and the seventy-two luxury condos were selling quickly despite being among the most expensive boxes in the sky in the country (up to $520,000 per unit). Globe and Mail, June 18, 1983. The first major preview for the public on March 21, 1983 had a few hiccups. The plan called for the tower’s clock to start ticking as soon as spring officially arrived in England. Guests watched as 4:39 p.m. rolled around…and nothing happened. Mother Nature decided to bestow the event with the worst snowstorm the city had seen that year, which resulted in the layers of ice that froze the clock’s hands. An hour passed before workers cleaned off the clock enough for it to operate. The clock did not cause any problems when opening ceremonies were held in June. Why do so many advertising promotion pictures featuring the violin show the instrument in the hands of a person who has obviously never played a note in his life, certainly not a note that deserves to be heard? The Queen’s Quay Terminal advertising supplement…showed a picture of a violin lying across a score, with the bow underneath the instrument. Symphony and concert violinists pay large amounts of money for their bows, and would never treat them that way. It’s just not done. Additional material from the June 25, 1983 and July 8, 1983 editions of the Globe and Mail, and the March 22, 1983 and June 22, 1983 editions of the Toronto Star.